A good portrait has something stirring alive beneath the surface. Know what it is? The artist. Every portrait is not only a reflection of the model, but also of the creator. The danger is getting caught up in working on a portrait so much that I can’t see the “forest for the trees”. I can become obsessed with small details and miss the big picture. That is why mirrors are my friends. I use this one to periodically to glance at the painting over my shoulder, getting a glimpse of the image in reverse. This has caught many drawing errors. 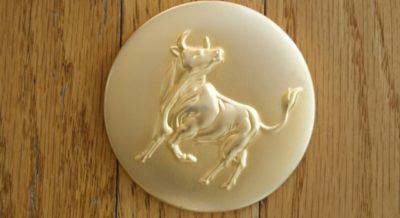 It is a make-up mirror that has the sign of Taurus on it. I received it many years ago as a birthday gift since I am a Taurus girl. It reminds me to stay tough to find that elusive **bleepity-bleepity** accuracy that a good portrait needs, but to look at the overall picture too. And just when I think I have a likeness nailed down and am ready to celebrate, I can look at the painting in a mirror and it may say I have more work to do. There is something alive about a good portrait and a mirror will show when there is not yet a soul…. 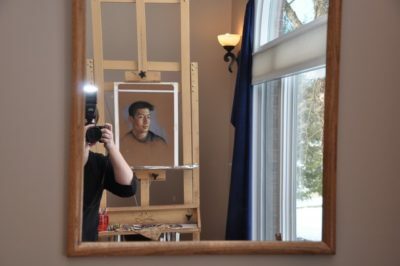 This mirror is on the wall across the room from my easel and lets me be more “removed” from the image. Again, giving me important details about the overall “feel” of the piece. It is amazing that all the many things that I struggle with will fall away when I look at the image in the mirror from this distance and in reverse. The larger picture emerges. Once the painting reads well both up close and in a mirror, I can breathe a little easier…. So I highly suggest getting a decent size mirror and hanging it across from your easel and behind you. Go for the big picture! Perfect timing! I have one resting on the easel at the precise time I should be employing this! 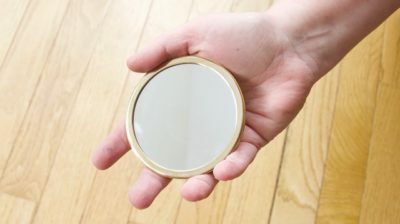 I have two hand mirrors but hadn’t considered a larger distant mirror. Thanks! sure! Yes, the distant mirror lets you really see how it looks from across the room- how most people would see it first- not up close. Hope it helps! Agreed. Can’t remember when I learned about using a mirror, pretty much in the way you’ve described, but it does open your eyes to things you’ve overlooked. of course! Hope you are getting the notices for these blog posts. I have another workshop coming up in June. I would love to have you there! Good “post” Christine. I have used the mirror technique too. It’s amazing how much it helps. I hope that you and your family are going well.